We designed and developed an effective nanopowder aerosolization setup and operating protocol. 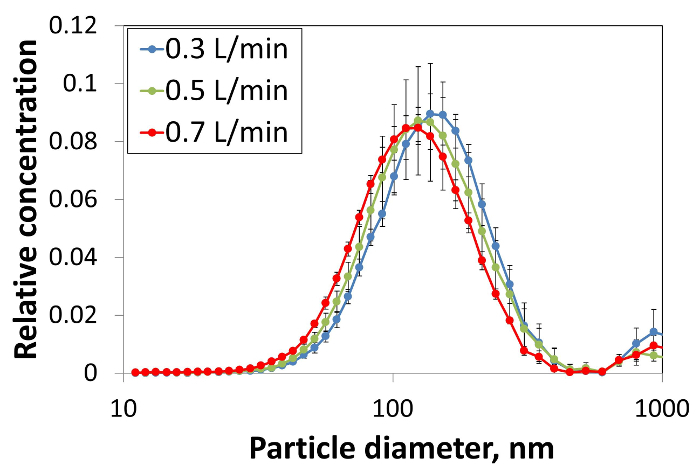 The system generated nanoparticle aerosols with stable number concentrations and size distributions for long durations, requiring only small quantities of test material (min. 200 mg). Ding, Y., Riediker, M. A System to Create Stable Nanoparticle Aerosols from Nanopowders. J. Vis. Exp. (113), e54414, doi:10.3791/54414 (2016). Nanoparticle aerosols released from nanopowders in workplaces are associated with human exposure and health risks. We developed a novel system, requiring minimal amounts of test materials (min. 200 mg), for studying powder aerosolization behavior and aerosol properties. The aerosolization procedure follows the concept of the fluidized-bed process, but occurs in the modified volume of a V-shaped aerosol generator. The airborne particle number concentration is adjustable by controlling the air flow rate. The system supplied stable aerosol generation rates and particle size distributions over long periods (0.5-2 hr and possibly longer), which are important, for example, to study aerosol behavior, but also for toxicological studies. Strict adherence to the operating procedures during the aerosolization experiments ensures the generation of reproducible test results. The critical steps in the standard protocol are the preparation of the material and setup, and the aerosolization operations themselves. The system can be used for experiments requiring stable aerosol concentrations and may also be an alternative method for testing dustiness. The controlled aerosolization made possible with this setup occurs using energy inputs (may be characterized by aerosolization air velocity) that are within the ranges commonly found in occupational environments where nanomaterial powders are handled. This setup and its operating protocol are thus helpful for human exposure and risk assessment. Nanomaterial powders are widely used in different industrial sectors, as the raw materials for manufacturing new products or as additives for their functional applications 1-4. However, the potential for workers' exposure to nanopowder aerosols has been noted during various occupational handling activities 5-8, and the associated health risks have been investigated in in-vivo and in-vitro toxicological studies 9-12. In order to facilitate the development of effective strategies to protect workers dealing with nanomaterials, occupational health professionals require a better understanding of how nanoparticle aerosols are generated from powdered materials subjected to external energy inputs. Different laboratory systems have been developed to simulate powder aerosolization behavior in realistic conditions. Among them, two standard procedures are the established reference methods 13 for testing powder dustiness, which is defined as the tendency of a powder, subjected to a given energy input, to release airborne particles. The first method uses a rotating drum as the medium for energy input and the aerosolization of powder particles 14,15. The second method drops a powder at a constant rate through a vertical cylinder and aerosolizes the powder particles by means of an ascending air flow 16. However, these methods require relatively large quantities of test materials (35 cm3 or 500 g), and this can be a problem with nanomaterial powders due to their high cost and the potential exposure risks. A scaled-down test system combining single-drop and rotating drum processes was developed, allowing the use of smaller amounts of test powders (6 g samples) 17. A recently developed aerosolization system based on vortex shakers has also been used for nanopowders, allowing tests down to 1 cm3 of raw materials 18. Here, we present a novel aerosolization and deagglomeration system for nanopowder testing based on laboratory funnels. It provides a stable aerosol generation process using less than 1 g of test powder. Steady aerosolization can be maintained for sufficiently long durations for robust aerosol characterizations. The system's performance has been described in detail in two previous publications 19,20. The test setup is composed of an aerosol generator, mixing and measurement compartments, and characterization instruments, as shown in Figure 1. Particle transport tubing and connectors link these different elements. A flow tuner and two flowmeters control and monitor the air flow conditions in the system. A manometer and a temperature and humidity sensor monitor the environment inside the measurement chamber. Dry compressed air is filtered using a hyperfilter before it enters the system. An elongated, V-shaped, glass aerosol generator is used for powder aerosolization. This geometry facilitates a robust aerosolization process and smooth particle transport into the subsequent compartment. The flow regime at the bottom of the funnel is turbulent due to the interaction with the powder particles, whereas it is laminar in the upper section (Re-number < 15). The thickness of the generator walls was specifically designed to resist the high pressures (up to 400 kPa ΔP) needed for deagglomeration testing using critical orifices. A high-precision flow tuner controls the flow rate in 0.01 L/min increments. Conductive tubing (6 mm outer diameter, 1 mm thickness) is used to avoid particle losses due to electrostatic deposition during transportation. The tube length is about 50 cm between the aerosol generator and the mixing chamber, 20 cm between the mixing chamber and the measurement chamber, and 100 cm for the sampling tubes. A 1 L metallic bottle is used as the mixing chamber, and a 12 L metallic drum is used as the measurement chamber. Particle samples are drawn from the top of the measurement chamber. An exit port directs the extra flow into a filtration system. The mixing and measurement chambers are electrically grounded to prevent electrostatic losses of particles. The measurement instruments include a scanning mobility particle sizer (SMPS) and an optical particle counter (OPC) for particle number concentration and size distribution, and a transmission electron microscopy (TEM) sampler (MPS) for particle morphology analysis. The setup's aerosolization procedure resembles a fluidized-bed process. The air flow enters from the bottom opening into the funnel (2 mm diameter) and aerosolizes the powder. The powder particles move in a similar way to water in a fountain. The aerosol generated meets a dilution flow in the mixing chamber. The dilution air flow can be conditioned for different levels of humidity if the effect of this parameter requires analysis. The chamber's air also serves as a buffer volume to smoothly mix the aerosol with dry dilution air according to the sampling needs. The aerosol flow is then introduced into the measurement chamber via a normal tube outlet (for aerosolization testing) or a critical orifice (for deagglomeration testing). The orifice can provide different pressure-drop conditions, applying shear forces to the particles passing through it. This mechanism allows the study of their deagglomeration potential (mechanical stability). Figure 1. Diagram of the aerosolization and deagglomeration system. By default, a tube connects the mixing chamber with the measurement chamber. The orifice shown is an optional add-on (not described in this protocol). Please click here to view a larger version of this figure. Make sure to use new or well cleaned particle transport tubing and connectors to assemble the system. Ensure that the chamber walls are cleaned and particle-free (refer to the cleaning methods at the end of the protocol). To remove potential background particles, connect a filtered dry air flow (5-10 L/min) directly to the mixing chamber (without installing the funnel between positions a and b in Figure 1), for at least 30 min. Measure the particle number concentration in the measurement chamber using the SMPS according to manufacturer's protocol. If the concentration is below 10 #/cm3 after three scans, then consider the environment clean. Note that the flow rate may slow when measuring using the SMPS. Stop the air flow and close the sampling tube outlets and the exit tube outlet with a plastic or rubber stopper (position c in Figure 1) to prevent ambient particles from entering the system. Prepare and warm up the measurement instruments (SMPS and OPC) and particle samplers for microscopic analysis. Store test materials in a well-controlled environment with respect to temperature and humidity. This is very important for ensuring repeatable results in follow-up experiments. Weigh the powder carefully using an analytical balance or high-precision balance, in a well-ventilated space (e.g., laboratory hood). Note: Weights of 250-500 mg TiO2, SiO2, ZnO and CeO2 nanoparticle powders were tested, and these generally proved to be sufficient for at least 30 min of stable aerosolization. However, the appropriate amount strongly depends on the powder type and may vary significantly for bulk materials, cement or organic powders. Fix the aerosol generator vertically, and feed the powder from the top opening of the aerosol generator using a properly cleaned laboratory funnel. Prior to the experiment, rinse the funnel with water and dry out by filtered air, to remove any dust deposition on the inner wall. Gently tap the funnel to ensure all the powder particles are fed into the process. Do not shake the funnel hard in order to avoid significant loss of the material to early aerosolization. Make sure that the majority of the powder particles reach the bottom of the generator, rather than falling on the surrounding sloping walls. Gently tap the side walls of the generator to move deposited powder particles down to the bottom. Alternatively, use a long funnel that directly deposits the powder particles at the bottom of the generator. For safety reasons, conduct these operations under a ventilation hood or inside a negative pressure chamber. As unsticky material may slip through the opening at the bottom of the generator, use a 2 mm diameter needle to temporarily block the opening before feeding in the powder. Remove the funnel and close the top and bottom openings of the generator in order to avoid particle emission during transfer. Install the aerosol generator, remove the blocks on the inlet and outlet tubing to the funnel, connect its bottom to filtered air supply and its top exit to the mixing chamber (positions a and b respectively in Figure 1), and attach it vertically with a metallic scaffold. Remove the blocks on the setup exit (position c in Figure 1). Switch on the aerosolization flow. Slowly increase the rate from 0 to 0.3-0.5 L/min using the flow tuner. Do not move to high flow rates too quickly-the aim is to reach a flow rate that can provide stable aerosol generation for at least 30 min. To achieve this, do not consume powder quantity significantly during this period of stable aerosolization. As an empirical rule, use a fluidized-bed height of about 1 cm (denoted by H in Figure 1) for generating a robust aerosol flow while maintaining a stable concentration over a relatively long period. If the energy put into the aerosolization process is too strong then the material will be rapidly used up, failing to sustain a steady aerosol generation during the rest of the experiment. Note that the flow rate range can vary for different powders; the values mentioned above were used for the abovementioned nanopowders tested. Switch on the dilution flow. Slowly increase the rate from 0 to 2 L/min. The total dilution flow needed is determined by the sampling equipment. The SMPS, OPC, and the mini-sampler used in the system presented here require a total flow of 1.6-1.8 L/min. Start the online measurement instruments simultaneously (here, the SMPS and OPC) as soon as the aerosolization and dilutions flows are introduced. Note: If a stable state of aerosolization is achieved, the aerosol particle number concentration and the size distribution should become stable after approximately 30 min. Use measurements starting from this time point for the comparison of aerosol properties under different conditions (e.g., humidity) and using different powders. Analyze the results from 10 consecutive SMPS scans to calculate average concentrations and size distributions. Once the aerosolization is stable, turn on the pump connected to the TEM sampler to start sampling the airborne particles. Use a flow rate of 0.3 L/min using the TEM grid coated with holey carbon film. The thin film on the grid may be damaged if the flow rate is too high. Detailed information on the use of the sampler is available 21. Typically, the sampling process lasts for about 3 min. Vary the sampling duration according to the different particle concentrations, and approximate by considering a moderate surface coverage of the TEM grid by particle deposition (e.g., 50%). Thick depositions may modify particle morphology due to on-site agglomeration. After finishing the measurements, switch off the dilution flow and then the aerosolization flow. Disconnect the aerosol generator from the system, block its top and bottom openings, and transfer it to the cleaning space. Clean in a well-ventilated cleaning facility or an enclosed space, especially if hazardous materials have been treated. Disperse powder residues with water or organic solvents, depending on the hydrophilicity of the particle surface. Pour the solution off into chemical containers for safe recycling. After long experiments, test powders tend to stick firmly onto the glass wall and do not dissolve easily. If this occur, use acids or bases together with an ultrasonic cleaner to dissolve sticky materials. In order to remove any moisture content left on the wall and to thoroughly dry the inside of the generator, pass dry air through it for at least 1 hr. Make sure there are no flames or ignition sources when working with organic solvents, and ensure good ventilation of the space. Disconnect particle transport tubing and connectors. Rinse them with water or solvents. Wipe the inner walls of the mixing and measurement chambers with a wet paper tissue or cloth. Dry them in an open space for at least a day or with dry air flow for 1 hr prior to next experiment. Regularly clean the SMPS impactor (if used). Figure 2 shows a typical example of total aerosol particle number concentration and size changes over time, using the above protocols in an aerosolization experiment with hydrophobic SiO2. Particle concentrations started to rise as soon as the aerosolization flow was introduced. The geometric mean size of particles gradually increased as well. After approximately 10 SMPS scans (3.5 min/scan), the aerosol started to enter a steady state, where particle concentration and mean diameter no longer varied by any significant amount. This state lasted more than 30 min, which was sufficient to complete ten 3-min SMPS scans. Figure 3 shows the change in particle concentration in the form of individual size distributions (based on the same data as in Figure 2). The peak rose slowly over time, and once the aerosol became stable, it remained within the same size range throughout the rest of the test. The very small mean diameter shown at the beginning of the experiment was not due to unstable powder aerosolization. Rather, it was caused by the residual ambient air inside the funnel after the powder filling procedure. This volume of air was the first to flow into the measurement chamber and was sampled by the SMPS during its initial scans (Figure 4). This could be avoided by carrying out all the experiments in a clean room if this was required by the scientific question at hand. 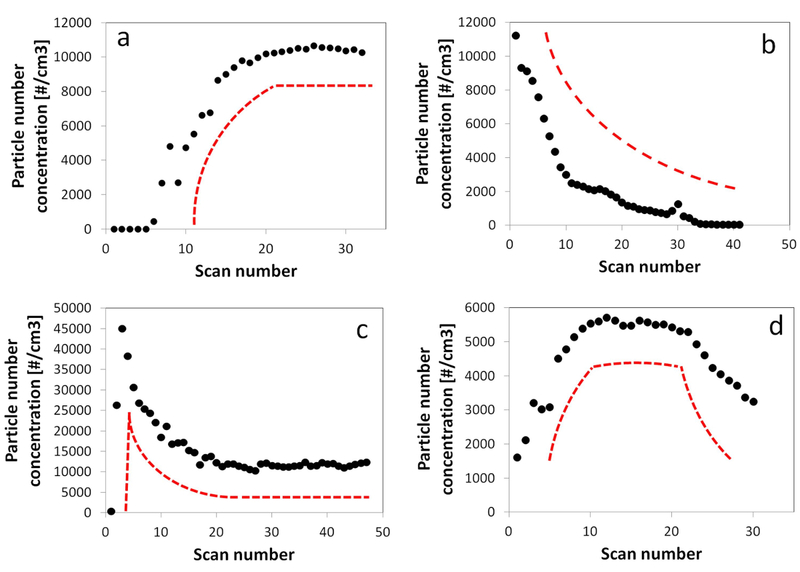 Indeed, the size distribution of the first scan was very similar to that of the ambient air. As the powder aerosol particles continued to flow in, the interference from the ambient particles diminished rapidly, and the effect had nearly disappeared after a few SMPS scans. Figure 2. Change in total particle number concentration and mean diameter in an aerosolization experiment (241 mg hydrophobic SiO2; aerosolization flow 0.3 L/min). Please click here to view a larger version of this figure. Figure 3. 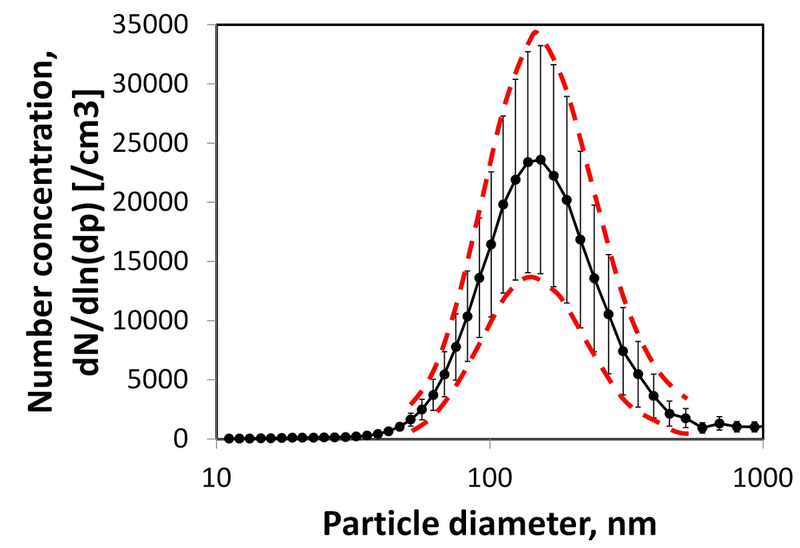 Change in particle size distribution in an aerosolization experiment. Please click here to view a larger version of this figure. Figure 4. Aerosol particle size distributions at the beginning of the aerosolization test. Particle concentration is presented on a relative scale (normalized to the total number) in order to compare the spectrum from the first scan in a very low concentration to spectra from later scans in higher concentrations. Please click here to view a larger version of this figure. The changes in particle concentration do not always follow the same patterns. Four possibilities can usually be seen in an aerosolization test. In Figure 5A, the concentration slowly increased to a "plateau" region, then remained nearly unchanged for the rest of the experiment. In Figure 5B, the concentration first rose to a maximum point, gradually decreased to a low level, and then remained stable for more than 1.5 hr. In Figure 5C, the concentration continued decreasing to zero. In Figure 5D, the concentration increased to a maximum level, remained there for a certain period, and then decreased again. Scenario (a) is usually seen when the standard operating procedure is followed. The aerosolization air flow is slowly introduced and finally stabilized within the proper range. The amount of raw material is sufficient with respect to the aerosolization level, and a constant aerosol generation rate can be maintained for a long period of time. Scenario (b) is most likely due to an excessive aerosolization flow throughout the experiment, combined with an insufficient quantity of powder. The powder is rapidly consumed and is not able to sustain stable aerosol generation. 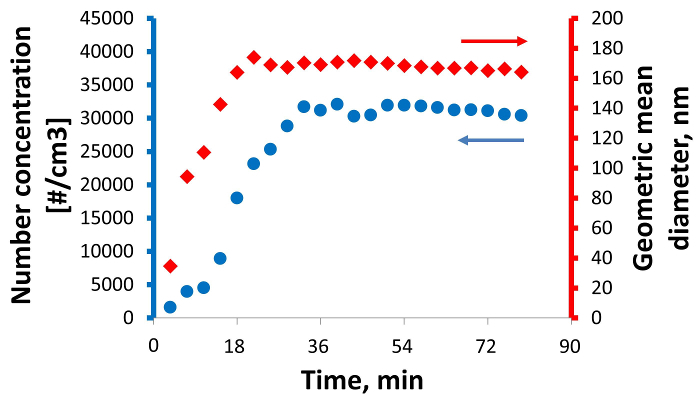 Scenario (c) shows a similar drop in particle number concentration to Scenario (b) except that after a short time, the air flow rate was re-adjusted to a suitable range and kept constant throughout the rest of the test. This allowed the particle concentration to gradually reach a stable range. Scenario (d) appears when an insufficient amount of raw material is used. At the latter phase of the experiment, there is no longer enough test powder to generate aerosol particles at a constant rate, as was possible in the early phase of aerosolization. Consequently, the particle concentration in the system decreases. Figure 5. Typical patterns for changing total particle concentrations during aerosolization experiments: (A) slowly increase until a plateau is reached; (B) gradually decrease to zero; (C) rapidly reach a peak and then decrease to a stable level; (D) increase to a steady state and maintain for a certain period of time, then decrease. Please click here to view a larger version of this figure. Different aerosolization flow rates were tested in order to study their influence on aerosol generation. Flow rates from 0.3-1.1 L/min were used, and the resulting particle size distributions are shown in Figure 6. The peak of the spectrum rose as the flow increased. At the highest flow rate (1.1 L/min), micron-sized airborne particles started to enter the system (the secondary peak). The modal sizes of the aerosol particles stayed similar when under the same aerosolization flow, however, they decreased gradually when air flow increased through the range from 0.3-0.7 L/min (Figure 7). The increasing particle generation rate and diminishing mean particle diameter as flow rates increased suggest that the more dynamic aerosolization process (with significant particle movements and collisions) facilitated deagglomeration of powder particles, resulting in a modified size distribution of the aerosol particles generated. Figure 6. Changing particle size distributions with increasing air flow rates (0.3-1.1 L/min). Please click here to view a larger version of this figure. Figure 7. Comparison of particle size distributions under different flow rates. The spectra were turned into similar heights in relative scale (normalized to total particle number), which shows better the shift of the peak. Please click here to view a larger version of this figure. The particle number concentrations of aerosols generated in replicate tests can vary by up to several folds, but usually well within one order of magnitude. The mean particle size, on the other hand, is highly reproducible. Figure 8 shows an example of the variation in particle size distribution from four replicate tests using the same material. The standard deviation was 39.7% for the total particle concentration and 6.6% for the geometric mean size. The variation of the number concentration could be due to several reasons: 1) different raw material status (e.g., agglomeration level); 2) human factors in powder filling process (influence the powder quantity deposited at the funnel bottom, thus the amount available for aerosolization); or 3) air flow adjustment at the beginning of aerosolization. Figure 8. Variation of test results from replicate aerosolization experiments with hydrophobic SiO2. The error bars represent the standard deviation of particle number concentration in individual size channels. Please click here to view a larger version of this figure. The funnel based aerosolization setup can effectively activate powder particles at a chosen energy input level (may be quantified by air flow velocity during aerosolization). Particle movements and collisions at the generation site reach an equilibrium state, breaking up powder agglomerates and emitting airborne particles of the same size distribution at a constant rate. 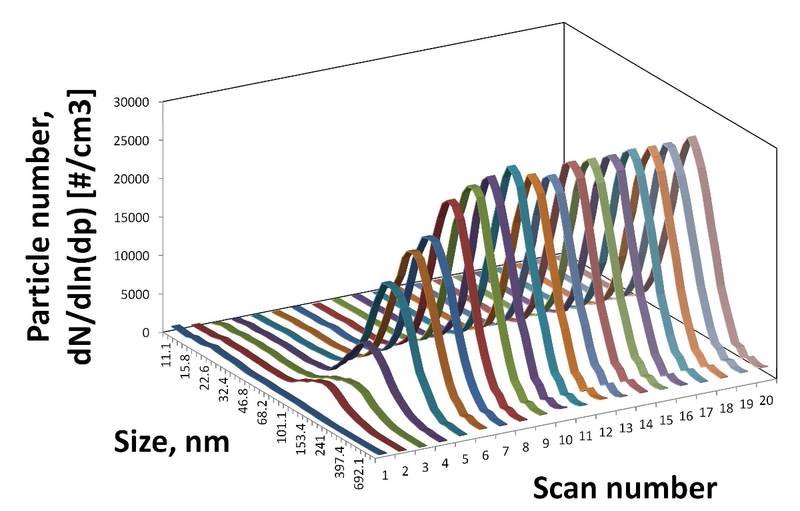 A stable aerosolization can last from 30 min to up to 2 hr, which is sufficient time for even slow measurement instruments with high size resolutions, such as the SMPS, to produce statistically significant results. The setup only requires small quantities of test materials, which can be an advantage for testing precious materials such as nanoparticle powders. However, the system's environment and process parameters can significantly influence the test results. To produce repeatable data, standard operating procedures must be strictly followed throughout the experiments. When conducting aerosolization tests using this system, the following aspects should be carefully considered. Firstly, to obtain meaningful results, it is critical that the setup's internal parts provide a clean environment for the tests. Potential sources of contaminants are ambient particles and test materials from previous experiments. The effect of ambient particles usually disappeared relatively quickly, as soon as the aerosolization and dilution flows were introduced. However, interference from residual materials can persist throughout the experiment. As the generated aerosol particles flow through the system, they can deposit on the inner walls of the transport tubes, the bending points and the narrow channels of the connectors, and the inner surfaces of the mixing and the measurement chambers. If these parts are not properly cleaned prior to new experiments, previously deposited materials can be constantly re-suspended into the main stream of the aerosol flow, thus disturbing the test results. Secondly, the powder filling process should be conducted very carefully. The most significant issue here is the quantity of the powder fed into the setup, especially when very small amounts of materials are used. At a given aerosolization flow rate, smaller amounts of powder generate lower aerosol concentrations, and possibly particles with smaller sizes, due to the higher energy input per unit weight of powder. Moreover, the storage conditions for test materials (e.g., relative humidity and temperature) have been shown to influence powder aerosolization behavior and levels of dustiness 22. Therefore, raw powders should always be kept in the same atmospheric conditions, where possible. Thirdly, adjustments to the aerosolization flow at the beginning of the experiment greatly affect the test results. Sharp increases in the flow blow large powder particles up into the air and spread them all over the funnel surface, dramatically reducing the amount of material available for the rest of the experiment. The consequences could be a failed test due to insufficient powder. Because the setup described here is not built using standardized laboratory equipment, when attempting to replicate the core parts of this system, the following aspects should be considered. Standard laboratory separatory funnels can be used as the aerosol generator (note that they should not be used under pressurized conditions). Separatory funnels of different geometries were tested in the experiments, and they provided similar functionality to the tailored funnel. A rubber sealing block with an embedded transport tube can be used as the funnel lid. Mixing and measurement compartments of different geometries but similar volumes can be used. Note that compartments that are too large will significantly delay the time needed to reach stable aerosol conditions (concentration). The time required can be estimated by taking into account the total air flow rate and the volume of the compartment. Although the process can be accelerated by using a large dilution flow, it should be remembered that the final particle number concentration can be dramatically decreased due to dilution, and this may influence the aerosol size distribution as well as the performance of the measurement instruments (depending on their detection limits). Electrically conductive materials are recommended. The length of the transport tubing may vary, depending on the general laboratory settings. However, the length should be kept as short as possible in order to avoid significant particle losses during their transport. The particle penetration efficiency can be calculated by taking into account particle diameter, air flow rate, tube diameter and length, and bearing in mind either gravitational deposition or diffusion loss, or both. Different characterization methods may be employed. However, the air supply (dilution flow) should be adjusted to match the total sampling flow rate. Insufficient air supply will result in negative pressure in the measurement chamber, drawing in ambient particles thus leading to mistakes in the conclusions. Different air supply sources can be used, but ensure that they are particle-free or pre-treat the air with a high-efficiency filter. One major limitation of this aerosolization method is that it requires good flowability of the test powders in order to maintain stable particle generation over a relatively long period. Sticky materials, such as hydrophilic powders with a high moisture content, often stop flowing at an early stage of the aerosolization process and produce very low particle concentrations. Potential ways of solving this issue could include a pre-treatment of the raw powder-such as drying-so as to improve its flowability. The storage condition of the raw materials after uses should be well maintained, e.g., kept in a dry environment and under suitable temperature. During the experiments, higher aerosolization flow rate (0.5-1 L/min) and larger amounts of raw material (e.g., 500 mg) could be used. Additionally, lowering the dilution flow rate can increase particle concentration in the measurement chamber. Another limitation of this method is the reproducibility of airborne particle generation rate (thus particle number concentration in the measurement chamber). Certain level of variation still exists. Possible ways of improvement are a better defined feeding process to reduce material losses, and well-controlled aerosolization flow rate. The system and protocols described here could be used for various applications. The use of relatively small amounts of test materials makes the method potentially valuable as an alternative tool for testing powder dustiness. The ranking of levels of airborne particles generated by our system for some common materials was similar to those observed in existing aerosolization systems 19, such as the rotating drum 15,17, continuous drop 23, and vortex shaker methods 24. Furthermore, the adjustable energy input (air flow rate) can also be used for studying the stability of nanoparticle powder agglomerates. 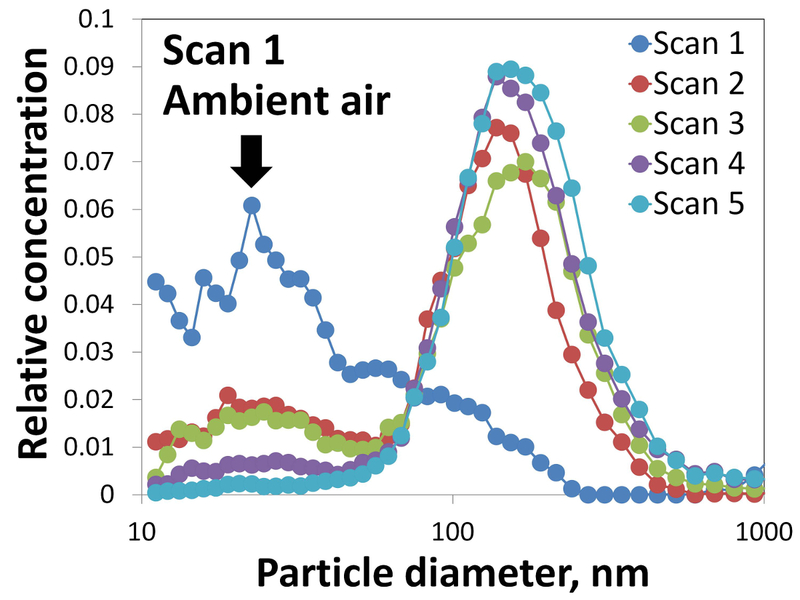 Finally, stable aerosol generation can serve as a reliable source of airborne engineered nanoparticles for in vivo or in vitro toxicological studies. The controllable particle concentration would allow an analysis of dose-dependent biological responses. Compared to other aerosolization methods using liquid suspensions, the presented method avoids potential problems such as material suspendability and modification of physical-chemical properties of particles in suspension (e.g., agglomeration, surface properties). The authors are grateful for the financial support given to this study by EU FP7 project ``Managing Risks of Nanomaterials`` (MARINA) (grant agreement no: 263215). scanning mobility particler sizer (SMPS) GRIMM Model N° 5.403 Size range: 11.1–1083.3 nm (impactor: d50=1,082 nm); composed of a condensation particle counter (CPC) and a dynamic mobility analyzer (DMA); sampling flow ate: 0.3 L/min; sheath flow rate: 3.0 L/min; with standard multiple charge correction and diffusion loss correction. Devaprakasam, D., Hatton, P. V., Möbus, G., Inkson, B. J. Effect of microstructure of nano- and micro-particle filled polymer composites on their tribo-mechanical performance. J. Phys. Conf. Ser. 126, 012057 (2008). Mukhopadhyay, A., Basu, B. Consolidation-microstructure-property relationships in bulk nanoceramics and ceramic nanocomposites: a review. Int. Mat. Rev. 52, 257-288 (2007). Svintsitskiy, D. A., et al. Study of cupric oxide nanopowders as efficient catalysts for low-temperature CO oxidation. J. Mol. Catal. A: Chemical. 368-369, 95-106 (2013). Schmid, K., Riediker, M. Use of nanoparticles in Swiss Industry: a targeted survey. Environ. Sci. Technol. 42, 2253-2260 (2008). Bello, D., et al. Particle exposure levels during CVD growth and subsequent handling of vertically-aligned carbon nanotube films. Carbon. 46, 974-977 (2008). Brouwer, D. Exposure to manufactured nanoparticles in different workplaces. Toxicol. 269, 120-127 (2010). Demou, E., Peter, P., Hellweg, S. Exposure to Manufactured Nanostructured Particles in an Industrial Pilot. Ann. Occup. Hyg. 52, 695-706 (2008). Kuhlbusch, T., Asbach, C., Fissan, H., Gohler, D., Stintz, M. Nanoparticle exposure at nanotechnology workplaces: A review. Part. Fib. Toxicol. 8, 22 (2011). Castranova, V. Overview of current toxicological knowledge of engineered nanoparticles. J. Occup. Environ. Med. / American College of Occupational and Environmental Medicine. 53, 14-17 (2011). Fukui, H., et al. Association of zinc ion release and oxidative stress induced by intratracheal instillation of ZnO nanoparticles to rat lung. Chem.-Biol. Interact. 198, 29-37 (2012). Lewinski, N., Colvin, V., Drezek, R. Cytotoxicity of Nanoparticles. Small. 4, 26-49 (2008). Kreyling, W., et al. Translocation of ultrafine insoluble iridium particles from lung epithelium to extrapulmonary organs is size dependent but very low. J. Toxicol. Environ. Health. 65, 1513-1530 (2002). Verlag, B. European Norm 15051, Workplace exposure-measurement of the dustiness of bulk materials. (2014). Breum, N. O. The rotating drum dustiness tester: Variability in dustiness in relation to sample mass, testing time, and surface. Ann. Occup. Hyg. 43, 557-566 (1999). Tsai, C., et al. Dustiness test of nanopowders using a standard rotating drum with a modified sampling train. J Nanopart Res. 11, 121-131 (2009). Bach, S., Schmidt, E. Determining the Dustiness of Powders-A Comparison of three Measuring Devices. Ann. Occup. Hyg. 52, 717-725 (2008). Schneider, T., Jensen, K. Combined Single-Drop and Rotating Drum Dustiness Test of Fine to Nanosize Powders Using a Small Drum. Ann. Occup. Hyg. 52, 23-34 (2008). Morgeneyer, M., Le Bihan, O., Ustache, A., Aguerre-Chariol, O. Experimental study of the aerosolization of fine alumina particles from bulk by a vortex shaker. Powd. Technol. 246, 583-589 (2013). Ding, Y., Riediker, M. A system to assess the stability of airborne nanoparticle agglomerates under aerodynamic shear. J. Aerosol Sci. 88, 98-108 (2015). Ding, Y., et al. Dustiness and Deagglomeration Testing: Interlaboratory Comparison of Systems for Nanoparticle Powders. Aerosol Sci. Technol. 49, 1222-1231 (2015). R'milli, B., Le Bihan, O. L. C., Dutouquet, C., Aguerre-Charriol, O., Frejafon, E. Particle Sampling by TEM Grid Filtration. Aerosol Sci. Technol. 47, 767-775 (2013). Levin, M., et al. Influence of relative humidity and physical load during storage on dustiness of inorganic nanomaterials: implications for testing and risk assessment. J. Nanopart. Res. 17, 1-13 (2015). 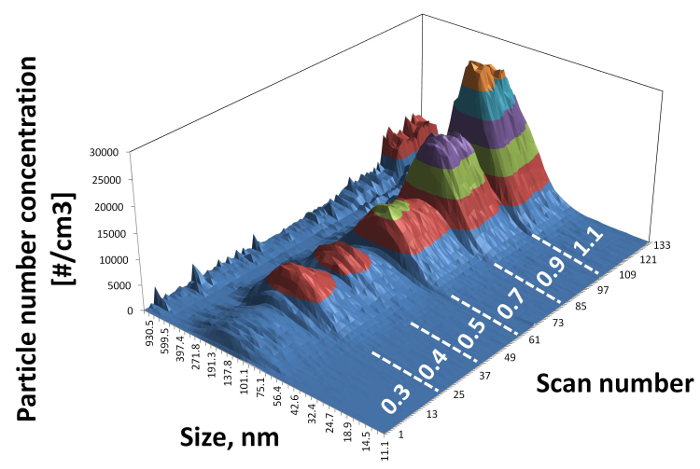 Dahmann, D., Monz, C. Determination of dustiness of nanostructured materials. Gefahrst. - Reinhalt. L. 71, 481-487 (2011). Ogura, I., et al. Dustiness testing of engineered nanomaterials. J. Phy. Conf. Ser. 170, 012003 (2009).